Sturgis Buffalo Chip- Sturgis, S.D. 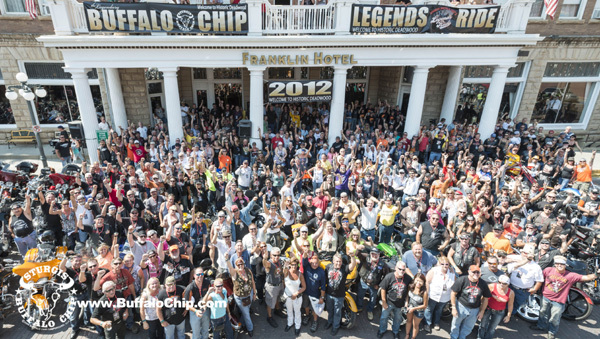 (Aug 21, 2012) – The Sturgis Buffalo Chip® earns honors from rally attendees as top destination during the 72nd Sturgis Motorcycle Rally. While other Sturgis venues and properties struggled during the annual rally, The Sturgis Buffalo Chip® camp resort and music festival, achieved the largest attendance in its 31 year history by a wide margin. 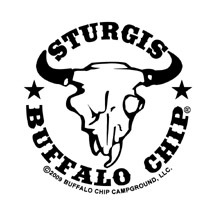 With more onsite campers and more concert goers then ever before, visitors have proven the Sturgis Buffalo Chip® is the #1 destination in Sturgis. Visitors from all 50 states and 24 counties flocked to the Buffalo Chip® for its high end amenities, fun activities and world class entertainment. Double headlining concerts once again drew capacity crowds as the music superstars such as Journey, Zac Brown Band, Lynyrd Skynyrd, Slash featuring Myles Kennedy and the Conspirators, Eric Church, BOSTON and Sugarland, just to name a few, rocked the Buffalo Chip’s® main stage for 9 straight nights of unforgettable music. The Chip, known as the “The Largest Music Festival in Motorcycling” is pleased to announce the confirmation of chart toppers ZZ Top and Toby Keith for their 2013 line up, with more major band announcements from some of the biggest names in music coming soon. An overwhelming selection of entertainment and activities once again ruled over the Buffalo Chip’s 580 acres as visitors chose from riding the exhilarating Zip Line, the longest in South Dakota, shooting a real machine gun at the Guns of Freedom range, motorcycle stunt shows, fire dancers, comedians, getting inked at the Tattoo Cafe, live music on one of the many side stages or taking a plunge in the fresh water pond at Bikini Beach. The new, free to the public, CrossRoads at The Buffalo Chip® drew crowds with its 20,000 square foot Sturgis Rider Cafe with multi level decks, drink specials and great food, free music shows from national recording artists, the Wall of Death, Freedom Field of Flags, American Veterans’ Traveling Tribute with Vietnam Wall War Memorial, hypnotist shows, helicopter rides and the World’s Largest V-twin Motor Sculpture standing 30 feet tall and lighting the night with over 10,000 LED lights. The Buffalo Chip® was once again the center of attention for television networks and producers as TV crews roamed the Chip shooting multiple episodes with the Chip’s unique and exciting backdrops and unlimited excitement from campers and visitors. Paul Jr. Designs unveiled two custom creations on consecutive nights live on the main stage in front of massive crowds for the TV series American Chopper. The Travel Channel was on site filming three new documentaries featuring the Sturgis Buffalo Chip®. Rich Wyatt and American Guns filmed a gun reveal at the Buffalo Chip Shooting Rage, and the star of American Pickers, Mike Wolfe, was also on hand at Chip to name just a few. Victory Motorcycles once again selected the Sturgis Buffalo Chip® as the destination for their annual Victory Owners Group ride and reception party. The ride this year, led by retired USMC Gunnery Sergeant, film and TV star, as well as spokesmen, R. Lee “Gunny” Ermey, saw a record number of Victory riders in attendance to take in all the hospitality at the Chip. While at the Chip, Victory also awarded a donation of $100,000 to the Wounded Warriors Foundation live on the main stage as part of the Buffalo Chip’s Military Tribute Day. Indian Motorcycles in partnership with Jack Daniels chose Sunday night prior to the Zac Brown concert to unveil 2 new custom designed motorcycles to the week’s largest crowd. The custom bikes will tour the nation with Indian and Jack Daniels before being auctioned to support and drive awareness for Zac Browns charity, Camp Southern Ground, a summer camp for special needs children. The Harley-Davidson® Owners Group known as H.O.G. staged the Buffalo Chip Experiences as part of their annual members’ ride and reception party. H.O.G. members from around the world joined friends and 2X UFC Heavyweight Champion Frank Mir and top UFC Welterweight contender Thiago Alves for an evening of festivities including an amazing concert by country crossover superstar Eric Church. 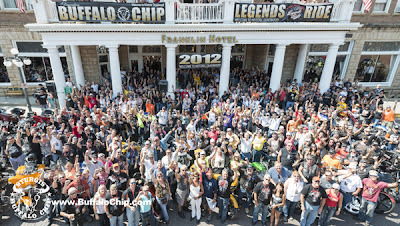 The 5th annual Legends Ride from Historic Deadwood to the Buffalo Chip® was once again a sell out. Participants joined icons from the worlds of motorcycling and entertainment such as Arlen, Cory and Zack Ness, Daredevil Robbie Knievel, film and TV star Kristi Swanson, 5X Olympian Lloyd Eisler and legendary guitarist for the Classic Rock band Journey, Neal Schon, on this charity event that traditionally signals the start of the rally. After the ride through the beautiful canyons of the Black Hills, Neal Schon and Journey rocked the Legend Riders with an unforgettable concert. One of the highlights of the Legends Ride was the presentation of a new luxury bus to the Black Hills Special Olympics to transport athletes to events year round. The crowd cheered as the Special Athletes filed out of the bus on the main street of Deadwood. This year the Legends Ride raised over $48,000 with 100% of rider contributions split between two local charities, The Black Hill Special Olympics and the Sturgis Motorcycle Museum. The annual Biker Belles Ride, presented by Harley-Davidson®, was a celebration of real women, real stories and real fun as participants came together for a charity ride that began at the Lodge at Deadwood and concluded at the Crossroads at The Buffalo Chip®. 100% of rider contributions go to the Sturgis Motorcycle museum and Helping with Horsepower, a foundation dedicated to helping at-risk girls. The charity event kicked off at the Lodge at Deadwood with a symposium of leading industry women including Laura Klock of Klock Werks, Claudia Garber of Harley-Davidson®, Marilyn Stemp of Iron Works magazine, Genevieve Schmitt from WRN, Christine Paige Diers of the Sturgis Motorcycle Museum and TV personality and custom fabricator Jessi Combs, co-host of Overhaulin’ and host of All Girls Garage. The event concluded at the Chip with an auction, biker fashion show, and concert by Eric Church. One of the Buffalo Chip’s center piece events is the Motorcycles as Art exhibition curated by famed photographer Michael Lichter. This year’s exhibition titled Come together – The Spirit of Born Free celebrated the style and innovation from the early days of chopper building in the 60’ and 70’s by some of today’s hottest custom builders. The week long exhibition that also included a photo exhibition and art show from the some of the biggest names in motorcycle themed art world was located in the Russ Brown Events Center and was a major draw for Chip visitors. The Legendary Sturgis Buffalo Chip® has been offering campers and rally goers the Authentic Sturgis Experience™ for more than 31 years with world-class entertainment and a premium 580 acre camping resort. Make your reservations now for 2013 and get passes for some of the biggest names in music including superstars ZZ Top, Toby Keith and many more. Reservations can be made at BuffaloChip.com or by calling 605-347-9000.